I don’t have much in the way of overproof spirits in my bar. In fact, I only have one bottle that’s over 50% abv. – cask-strength Laphroaig. So, what can I do with a tight budget? Play off Laphroaig’s smokiness, of course. Sipping Laphroaig reminds me of camping, specifically on Minnesota’s North Shore. That’s where my wife and I were wed, and we try to make it up to the shores of Gitche Gumee at least once a year. 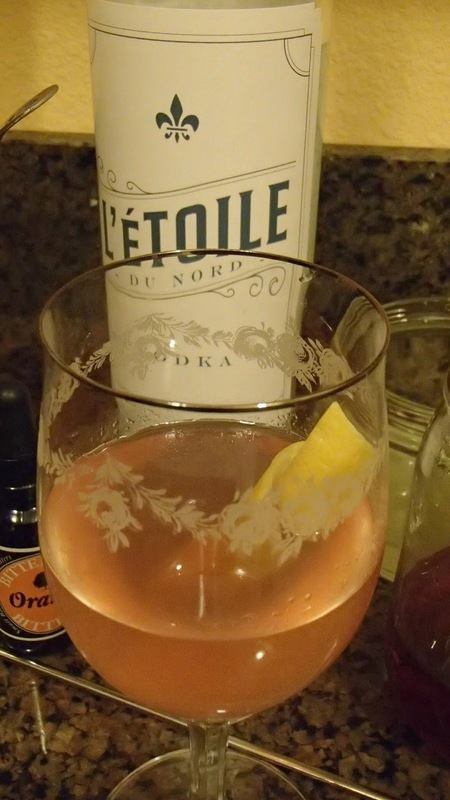 I wanted to make a drink that would evoke camping on a cool evening by the lake. The first thing I thought of was toasted marshmallows. They remind me more of camping as a kid, but regardless of age, they’re mighty tasty. But how to incorporate the smokey caramel sweet of the marshmallows? I decided to attack the problem head-on, by toasting an entire package of marshmallows. After toasting the marshmallows, I put them in a saucepan and added some water. 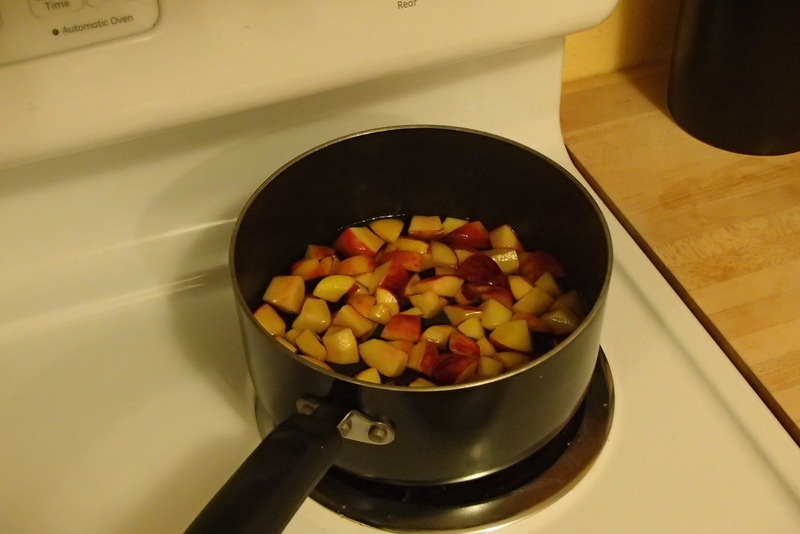 Once the marshmallows melted into a syrup, I strained out the burnt pieces, then put the syrup back into the pan and added some more sugar to taste. Surprisingly enough, the melted marshmallows weren’t sweet enough (compared to a traditional simple syrup) on their own. Fair warning to anyone who wants to make this syrup themselves: you haven’t gotten rid of the gelatin in the marshmallows. You’ve really just created marshmallow jelly. You’ll have to heat it up to make it a liquid again. It’s a pain when you just need a little for experimenting, but definitely manageable when using it to please a crowd. Once the syrup was finished, I tried several drinks with it, but nothing worked. The gelatin in the syrup, when chilled, caused the drink to separate much too quickly. Adding enough acid to threaten the gelatin overwhelmed the rather subtle toasted marshmallow taste. So I went back to where I started: heat. The key to this riff on a hot toddy, I’ve found, is procedural: keep everything as warm as possible as long as possible. It keeps the gelatin in the syrup under control, and it really allows the smokey aromatics throughout the drink to shine. I start by brewing the tea. 5 minutes, boiling water. 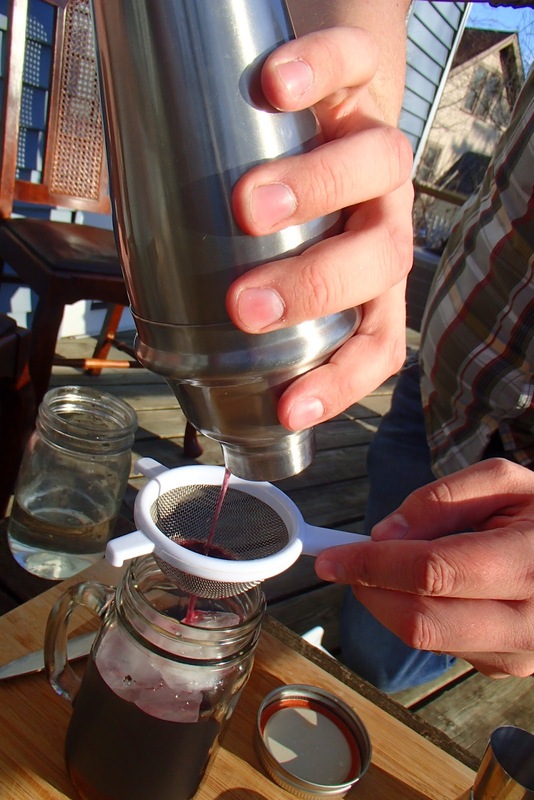 While that’s steeping, I fill the serving glass with hot water to temper it, and I heat up the syrup so it’s pourable. When the tea is done brewing, I begin building the drink. First, dump the hot water from the serving glass and rinse it with the Laphroaig. Then add the bitters, cinnamon tincture, lemon juice, syrup, and rye. Finally, top with the brewed tea, and serve immediately. This is a drink you taste just as much with your nose as with your tongue. The smoke of the tea and the scotch fill your nose as you take a sip, and the complex sweetness of the toasted marshmallow really comes through as it lingers on your tongue, supported by the chocolate and cinnamon without tasting like a s’more. Not that that’s a bad thing; that’s just a different drink. The lemon provides just that little bit of brightness, but really, any more than a barspoon or two can overwhelm the subtle syrup. 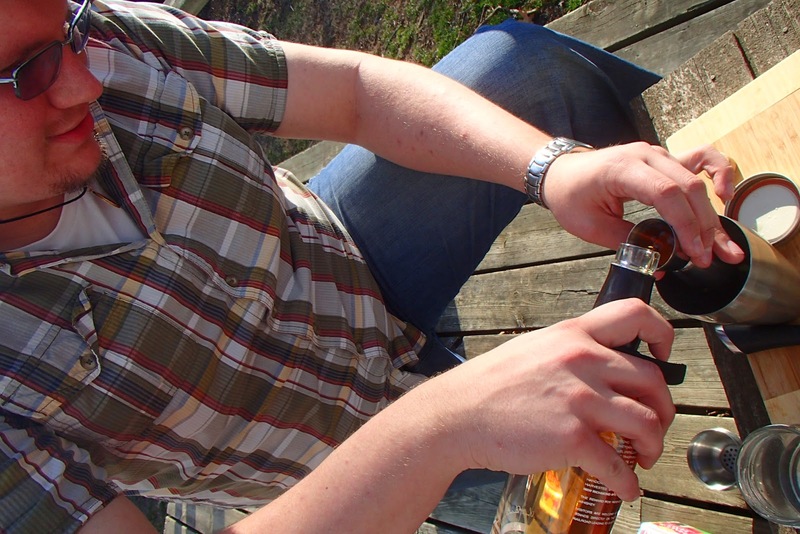 Then the drink finishes with that rye spiciness mixing with the smoke that’s still in your nose from earlier. It’s wonderful. In the future, I hope to expand my knowledge of overproof spirits. 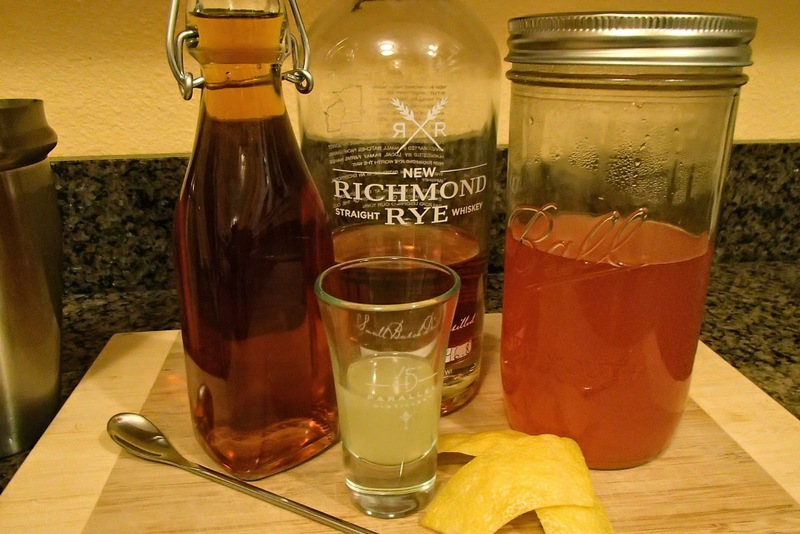 Right now, it’s limited to a few whiskies and, for better or worse, the grain alcohol I use to make limoncello. I look forward to reading about all the other great drinks submitted for this month’s prompt, and I have no doubt they’ll inspire me to get my hands on some strong spirits. Last summer, a group of friends from around the world congregated in my general area, and my wife and I threw a party for everyone, including some hand-crafted cocktails around the campfire. One of these friends is from Finland. As a gift, she generously gave me a bottle of Lakkalikööri, a Finnish liqueur made with cloudberries. Lakkalikööri, or Lakka for short, is very sweet, with a subtle and complex citrus flavor. While I have enjoyed sipping it on its own, I hadn’t made a cocktail with it. I found most other ingredients overpowered the subtle flavors of the Lakka. But, when I saw this month’s prompt, I was determined to finally utilize Lakka in a unique way. Not only does my bottle of Lakka remind me of the great get-together from last summer, cloudberries ripening is often a herald of the middle of the short Arctic summer. 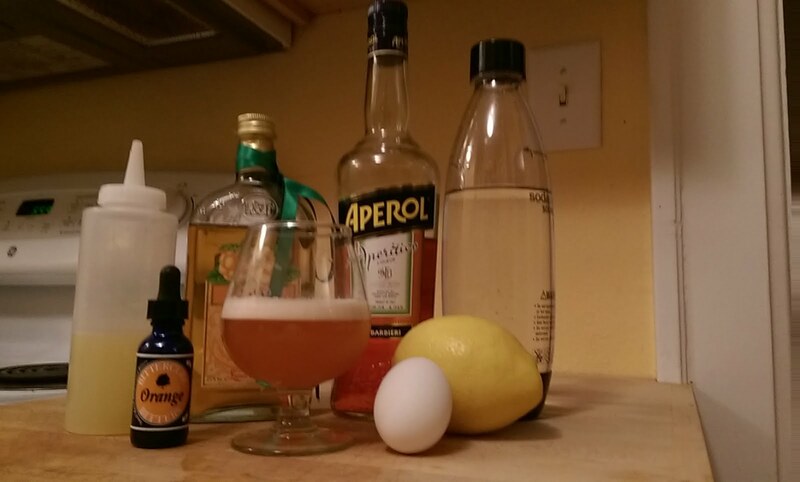 Combine the Lakka, Aperol, lemon juice, and egg white in a shaker. Dry shake vigorously for a minute, then add ice and continue to shake for a few minutes. Double strain, and top with remaining foam. Drop the orange bitters into the thick foam and swirl with a toothpick. Add some club soda to taste. Lakka, on its own, can be a little heavy and syrupy. To really make this drink evoke summer, I needed it to be light. So I avoided any of the traditional base spirits and went for an amaro to counteract the sweetness. However, most amaros are strong in their own right. Aperol’s more mild bitter orange flavors pair excellently with the complex citrus notes of Lakka, and the two liqueurs balance well. 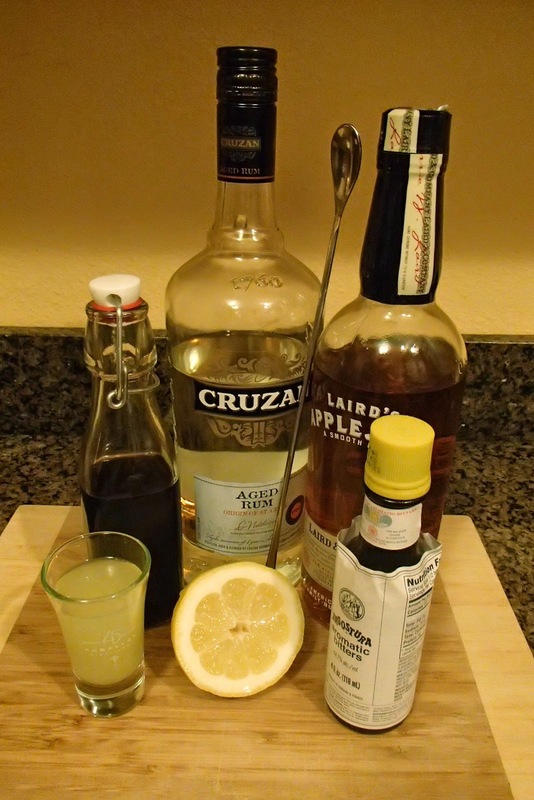 A little lemon juice brightens the drink significantly. 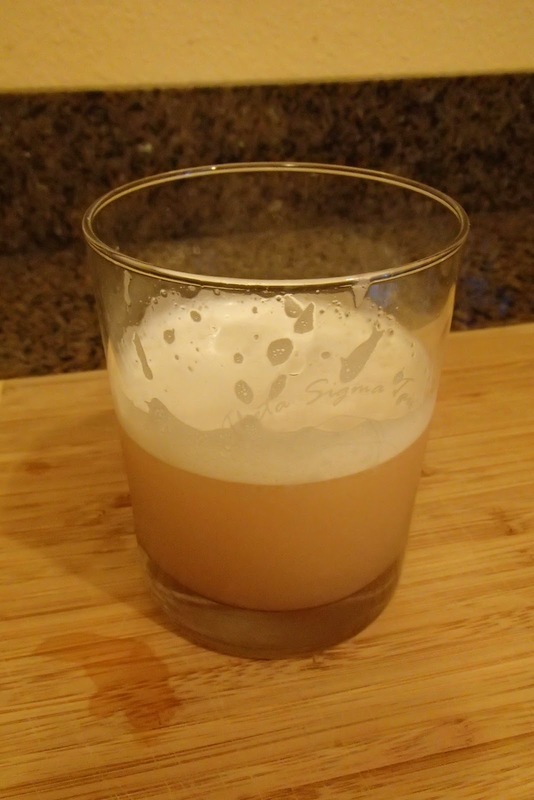 This drink is fairly acidic – a little egg white helps keep the drink silky smooth, and, when combined with a splash of club soda, gives it a cloud-like foam top. This is a bright, effervescent drink with powerful and complex citrus notes and a very drinkable bitter finish. The slight carbonation and foam keep My friend Kyle described the flavor as “smokey melted rainbow sherbet.” I don’t know if it gets more summery than that. Hello folks, it’s been a while. How’ve you been? This year got away from me quite fast. 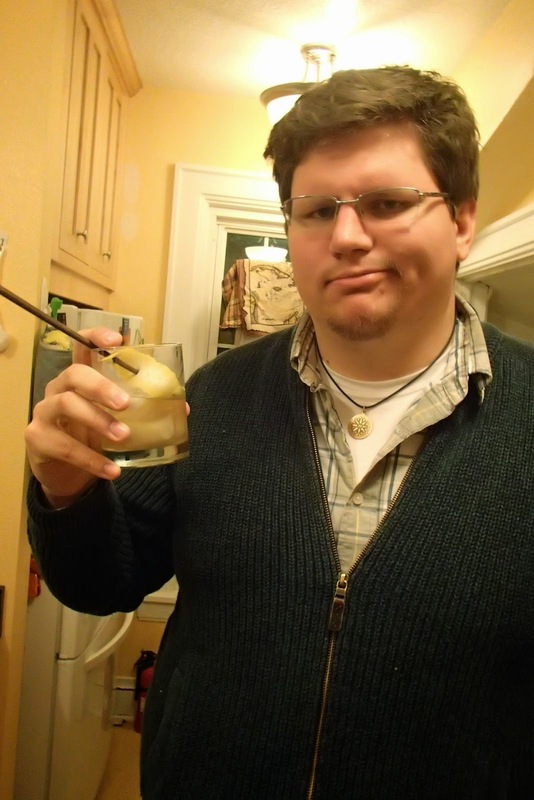 Life got in the way of my more trivial pursuits, which includes experimenting with cocktails. But, now that it’s winter again, I have plenty of time to tinker with spirits and flavors. It also helps that around this festive time of year, there are plenty of get-togethers and reasons to celebrate with a well-crafted cocktail or spirit. Since we last spoke (wow, six months? ), I’ve still been able to do a little cocktail crafting. I designed a yet-to-be-named cocktail for my friend’s wedding in July, I’ve made my own Irish cream, and I’ve got a batch of krupnik in the fridge. And, since my wife and I are hosting a New Year’s Eve party, I’m taking the opportunity to throw a little cocktail menu together. Since I’ve got a bunch of stuff to report back on, I’ll do my best to post once a week starting this weekend on these different projects. And if you’ve got any questions or ideas you’d like addressed, let me know! So there’s a cocktail contest being run by the Smithsonian. The goal? 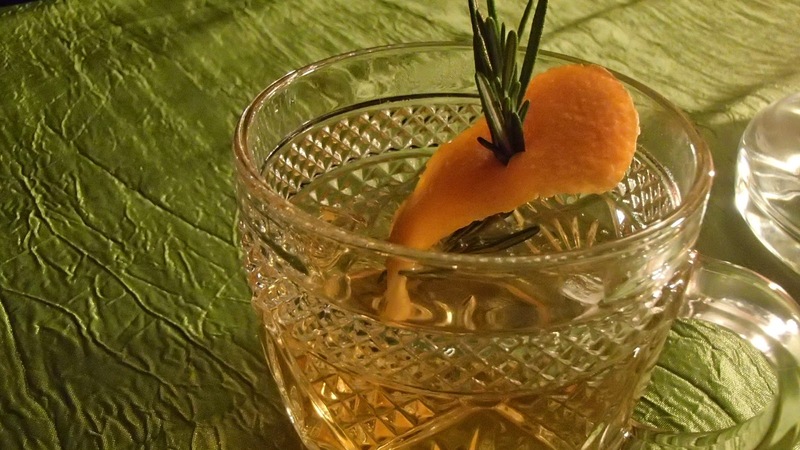 Design a cocktail inspired by the Star Spangled Banner. Well, as a student of history, I thought this might be fun to try and enter. I’ll be posting my recipe ideas for the contest here. If you’d like to try it out, please do and let me know what you think! I’m looking for criticism regarding the drink’s balance, flavor, appearance, and overall appeal. Here’s my first attempt. I don’t have a name for this yet, so Cocktail Contest Entry #1 will do for now. 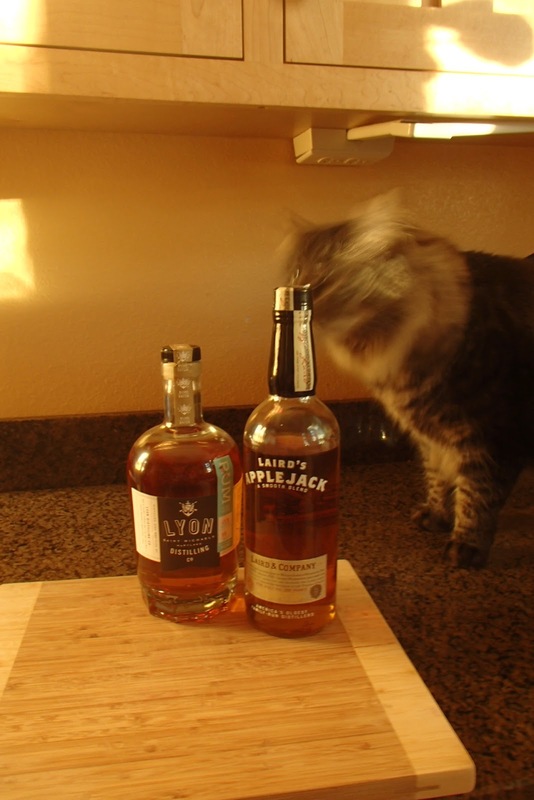 BlurryCat is interested in the applejack. Directions: combine all ingredients in a shaker. First, vigorously dry shake (without ice) to work up a nice foam. Then add ice and shake to chill. Strain into a glass and enjoy. I find the drink to be decently balanced between sweet and tart, with the apple and rhubarb flavors coming through quite nicely. The egg white really smooths everything out and gives the drink a silky mouthfeel. You can taste the sweetness of the dark rum (the molasses flavor accentuated by the brown sugar syrup), and the effervescence of the apple brandy dances on the tongue with the nice thick foam. One of the possible modifications I’ve tried already is adding a couple drops of Angostura bitters on the foam after straining, then using your barspoon (or a chopstick, or a knife, or your finger, or whatever) to make little stars for decoration. 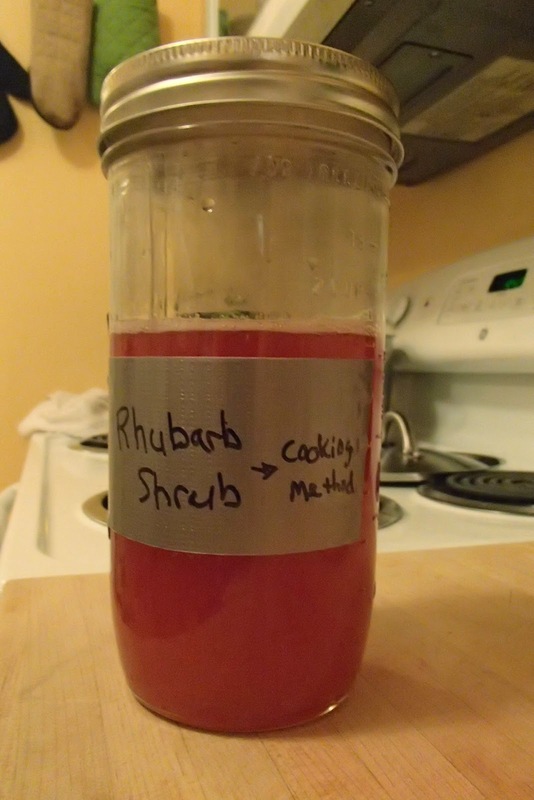 Following the recipe found here: chop the rhubarb into 1/2 inch cubes or so. 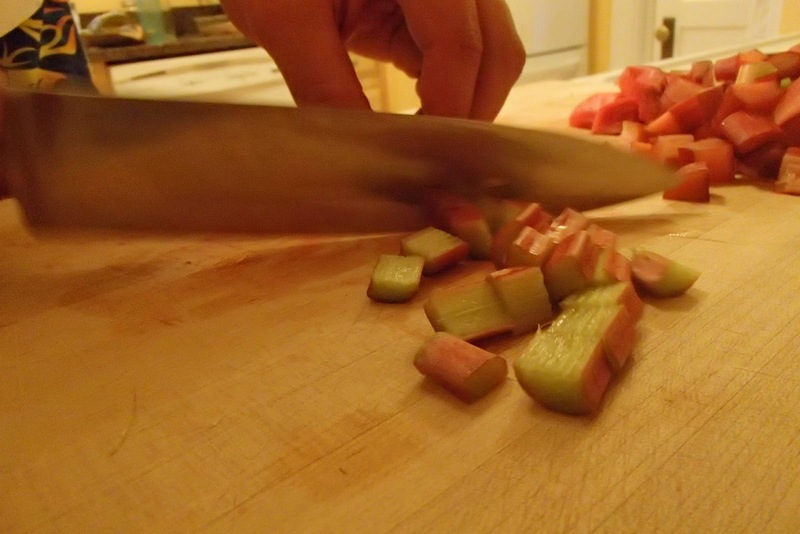 Place the chopped rhubarb, sugar, and apple cider vinegar in a saucepan and bring to a boil, then turn down the head and let cook for about 10 minutes. 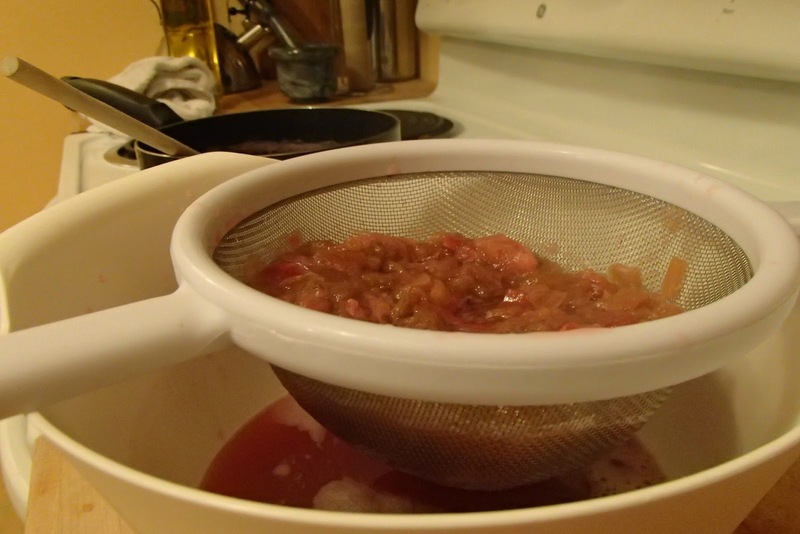 Once cooked, strain through a fine mesh strainer and/or cheesecloth, put in a sealed jar and let it mature in the fridge. 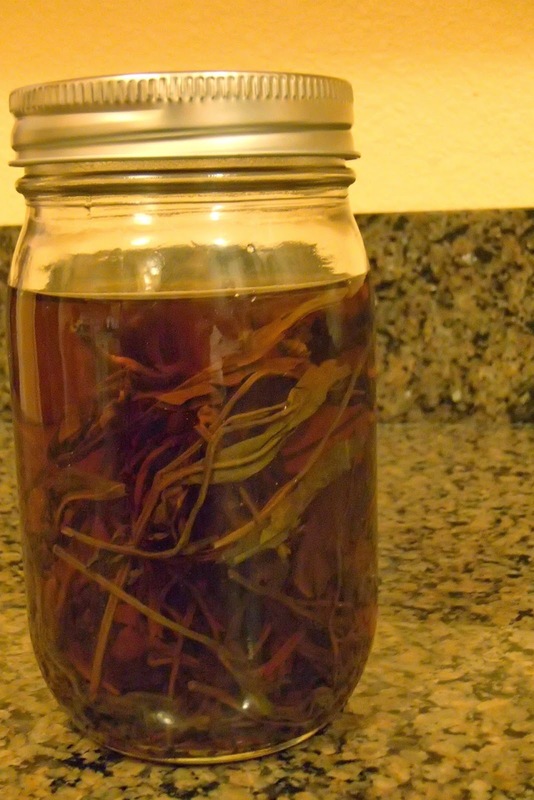 As it ages, the vinegar flavor will mellow, and it will be perfect after about a week. After that, it’ll last for several months. Place equal parts brown sugar syrup and water in a saucepan. Bring to a boil, then cook until all the sugar is dissolved. For those of you who test this out, thank you, and be sure to check back for more recipes to come! My goal is to submit two polished recipes to the contest. Thanks for reading, and cheers! Hey folks, it’s been a while. It’s been… a month since I’ve updated? I suppose there are a few reasons for that. Primarily, I’ve been trying to focus on one spirit per month, and this month was to be rum. But I can’t say I enjoyed the drinks I was making, and none of them felt worthy enough to share here. Combine that with money becoming very tight, it’s been rougher than I like. Luckily I was able to sneak ingredients like citrus into the grocery budget. But enjoy about that, let’s get to the drinks that I tried to make. 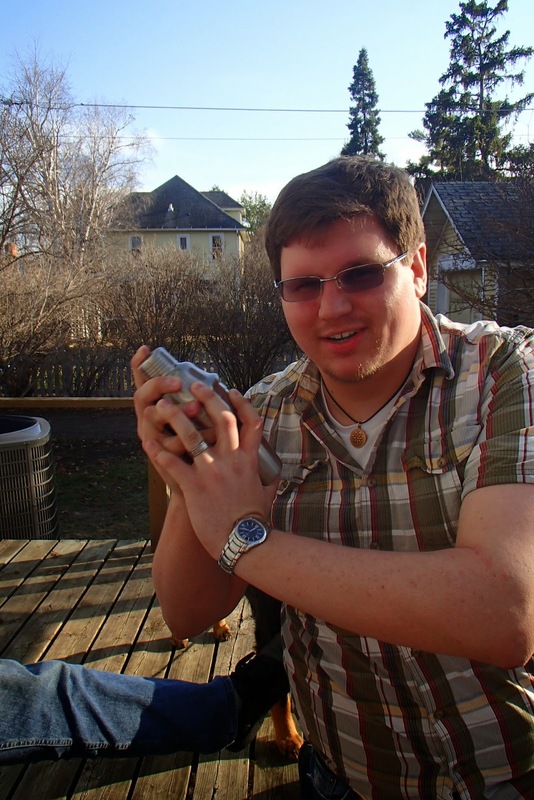 This drink was all right, but as you can see from my expression below, I wasn’t thrilled with it. It had a good bit of spice, and the balance was there. The applejack paired well with the rum, but the rum seemed to cut through the other flavors, unpleasantly so. I also tried a very classic Bumbo recipe (rum, water, sugar, and nutmeg) and a basic daiquiri (rum, lime juice, simple syrup), and neither particularly tickled my fancy. So, my conclusion from these experiments? I haven’t developed my taste for rum yet. This is an aspect of self-improvement that I think I’ll enjoy working on. In the interim, I’ve been making other things. 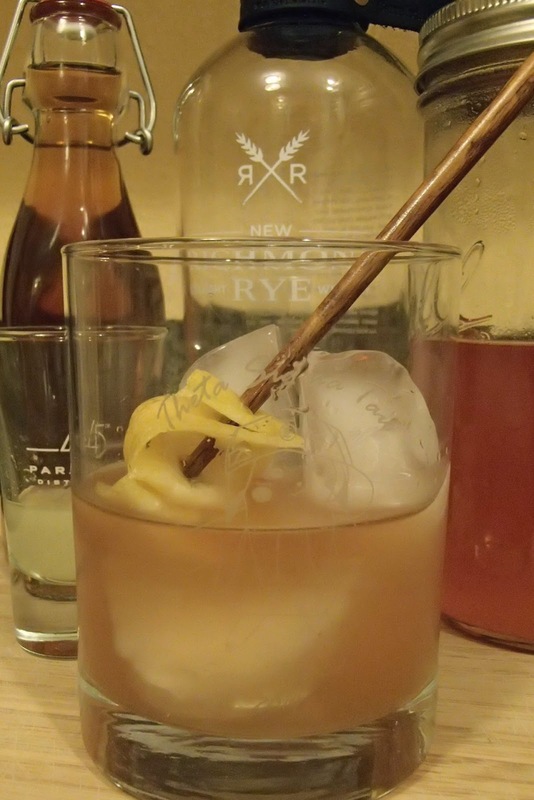 I made a Lion’s Tail for a Guess that Classic Cocktail segment on Reddit, I modified the Lion’s Tail replacing the bourbon and lime with rye and lemon, and that was a hit at a party I went to. For both of these drinks, I made my own Allspice Dram, which is white rum infused with allspice and cinnamon, and mixed with an equal part brown sugar syrup. I also started making some shrubs. What’s a shrub? I’ll explain that in a future post. But here’s a teaser picture. Spoiler: they’re tasty and easy to make! 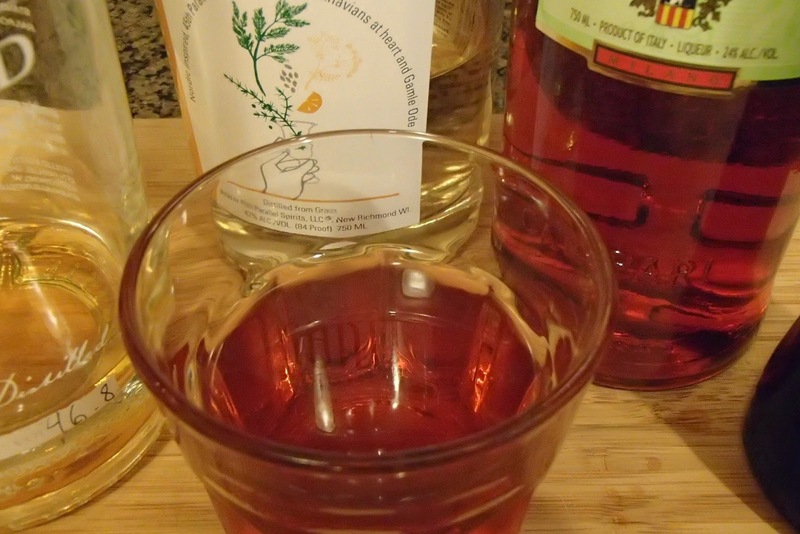 If you follow cocktail stuff on a regular basis, you probably already know about Negroni Week. A Negroni is simply 1 part gin, 1 part sweet vermouth, and 1 part Campari, an Italian amaro (i.e. bitter) liqueur known for its bright red color and bitter citrus and herbal flavor. Negroni Week is a campaign to spread the word about this complex cocktail and raise some money for charity through participating bars. Don’t like one of the ingredients? Swap it out. Possibly the best thing about a Negroni is how flexible it is. 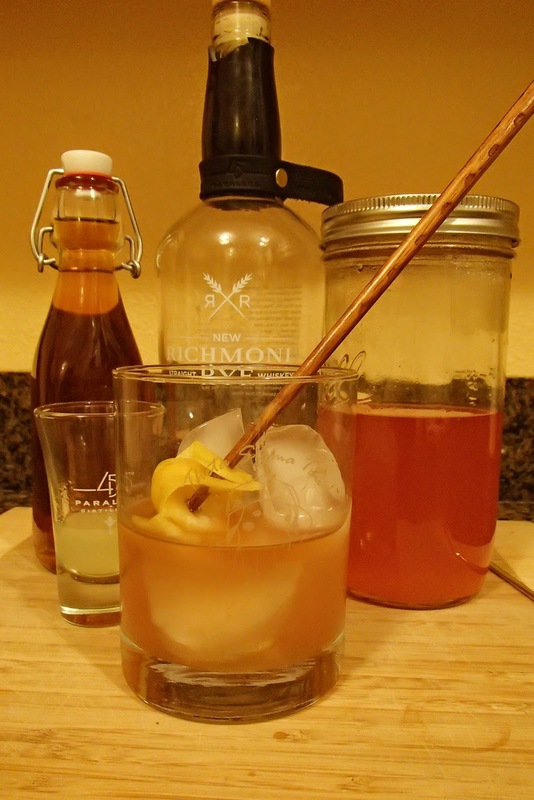 The combination of 1 part spirit, 1 part sweet, 1 part herbal can be changed to make all sorts of other drinks. Some of them have their own monikers, like the Boulevardier (replace gin with rye whiskey). Personally, I prefer my Negronis with aquavit instead of gin. But, inspired by Negroni Week, I decided to mix things up even more for my version, and I used both aquavit and rye whiskey in place of the gin. This created a negroni/boulevardier mashup that worked very well. It’s spicy and bold, and I find it more complex than the standard gin. The citrus in the Gamle Ode Celebration aquavit I used really blends well with the citus-y bitterness in the Campari. One final bit of news: the rum I won arrived! I’ll talk about my tasting notes for it in a future post, but my initial impression is that it’s a very mellow rum with a strong inherent sweetness. Stay tuned for more! 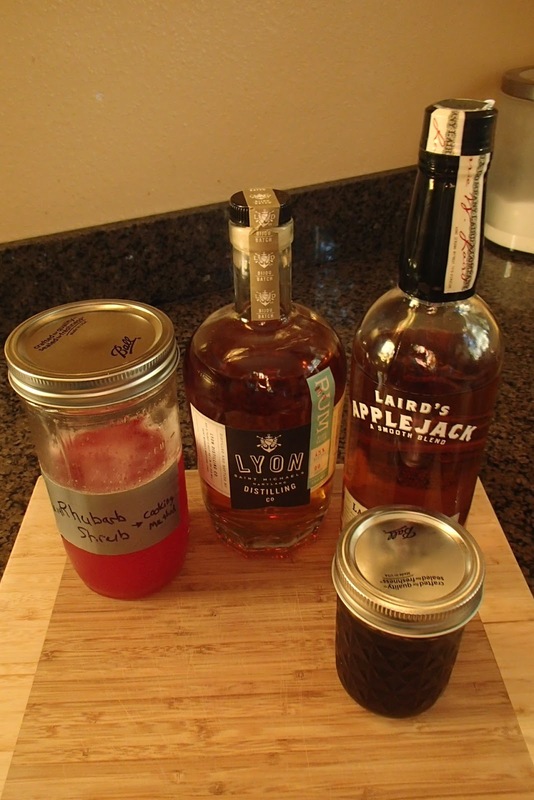 For the foreseeable future, I’ll be jotting down drink recipes and other experiments with syrups and mixers, and posting them here. Instead of trying to stick with a pattern like the first two months, this may be a little more organic now. I’ll still try to keep it seasonal with any fruit or other ingredients, and if you have any requests or suggestions, either for a spirit, a flavor, or a specific cocktail, I’d love to try it! And hopefully I’ll be bringing more content to the site, such as how-to articles and whatnot, so stay tuned and thanks for sticking with me. Thanks again for sticking with me, both through this long post and through my extended absence. 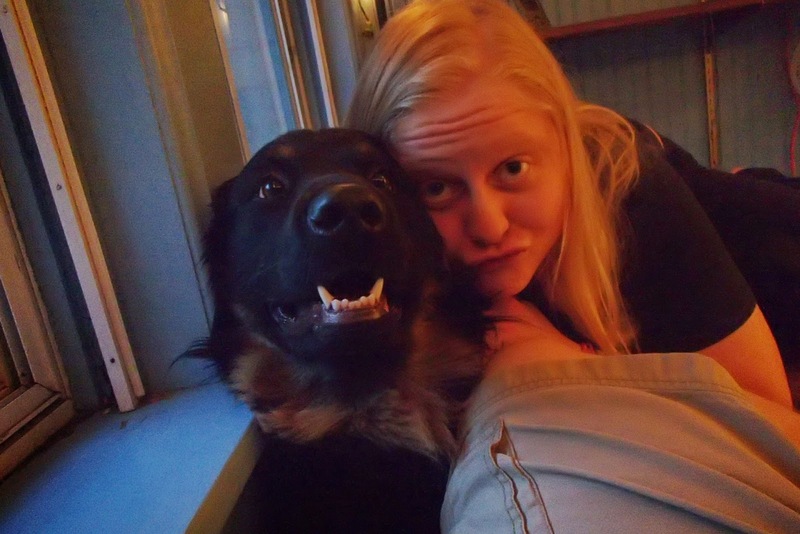 As a reward for your patience and resolve, here’s a picture of my wife and our puppy. Cheers! The weather today was gorgeous. 60°F, sunny, not too windy. 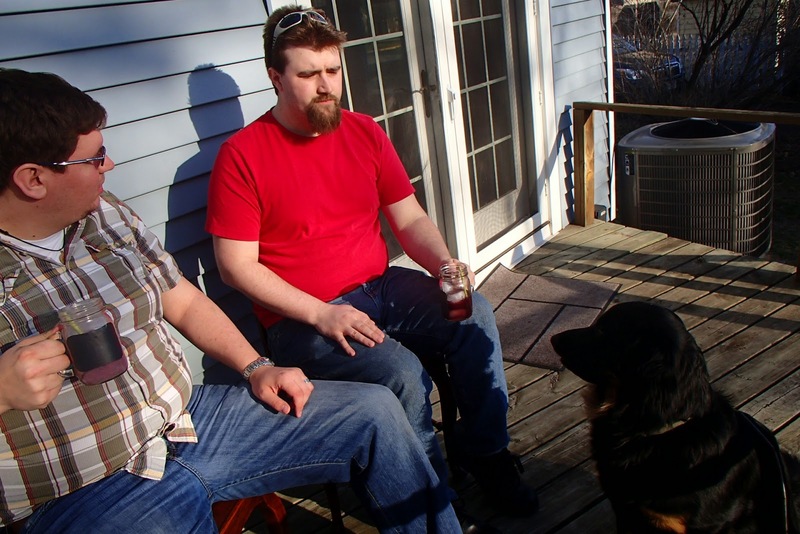 The perfect evening for sitting on a porch with a friend and sipping a refreshing cocktail. 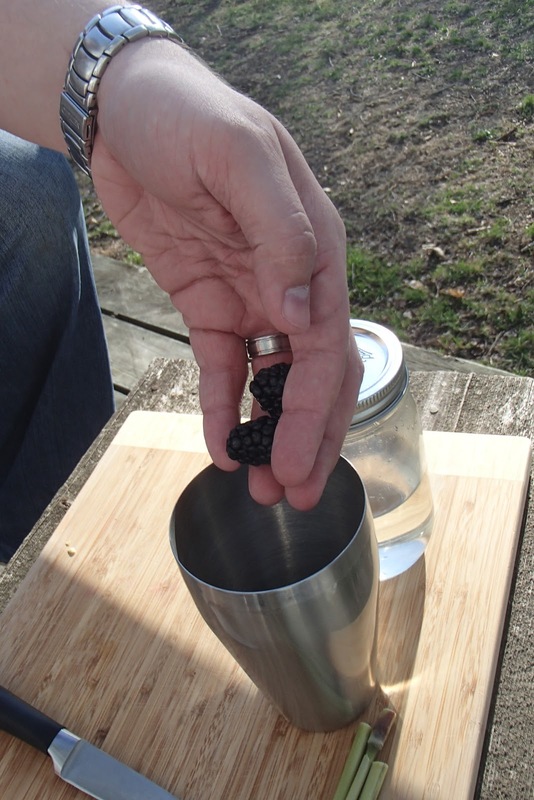 So for this week’s cocktail, we’ll take a swing at a Blackberry Smash in the backyard! A smash is a broad name for any drink that’s spirit plus herb plus fresh fruit. 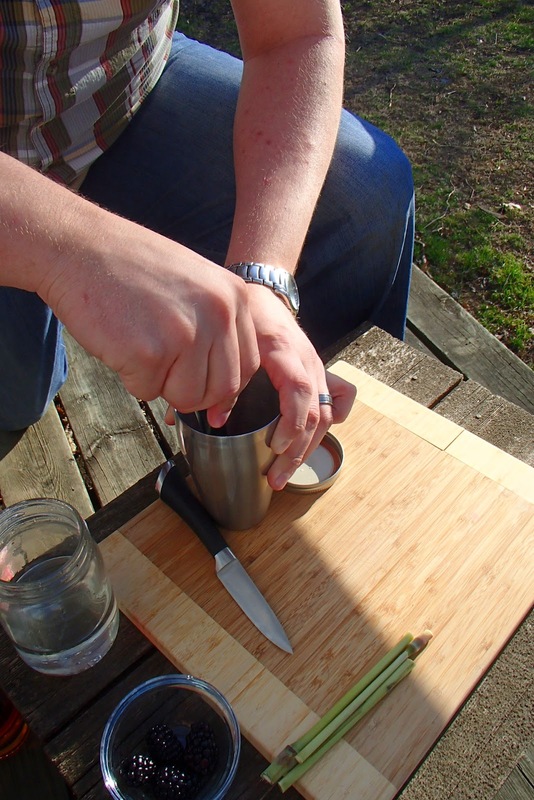 Think of it as a julep with more freedom. The name’s been around since the 1880s because it’s simple, flexible, and delicious. The original whiskey smash, as I understand it, was made with lemon and mint. Since I’ve used a lot of citrus recently, I decided to take the more subtle route this time and use some lemongrass. And I couldn’t wait until July for local blackberries. With a nice shot of our neighbor’s yard. Place the simple syrup, blackberries, and chopped lemongrass in a mixing glass and muddle vigorously. 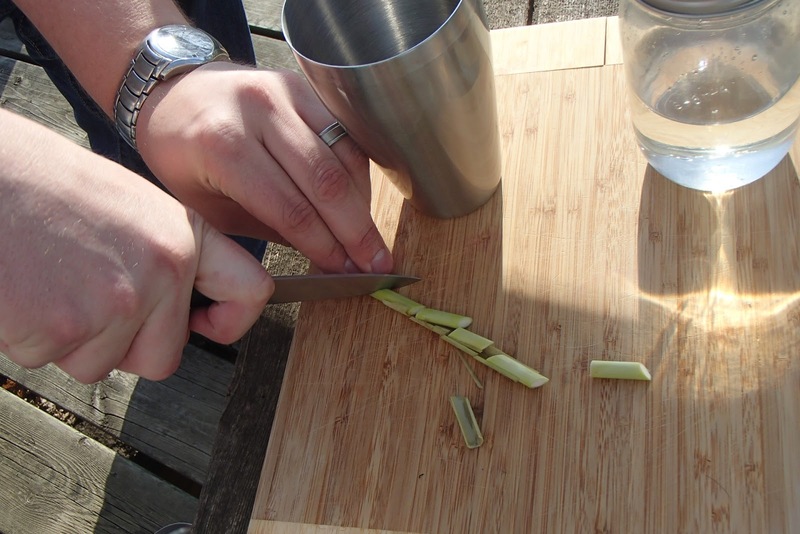 This could take a while; you want to get as much flavor out of the lemongrass as you can. 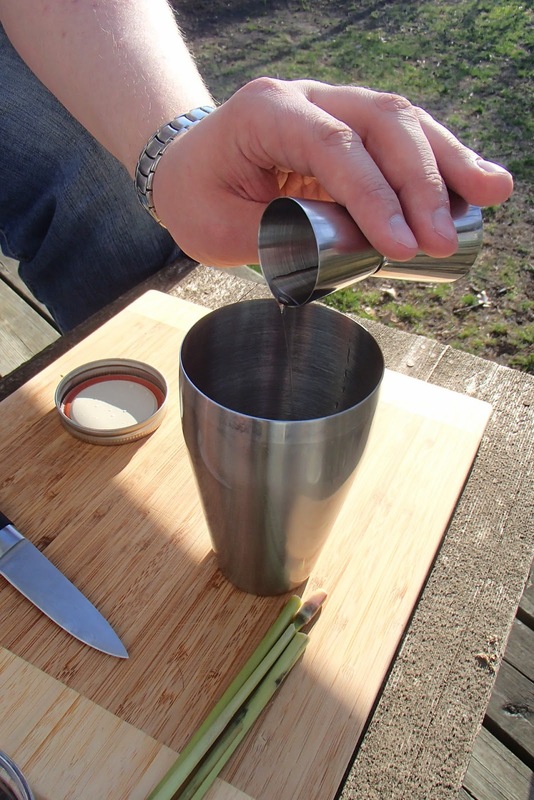 Don’t forget to taste the muddled mixture before adding the spirit to make sure you can taste the lemongrass. 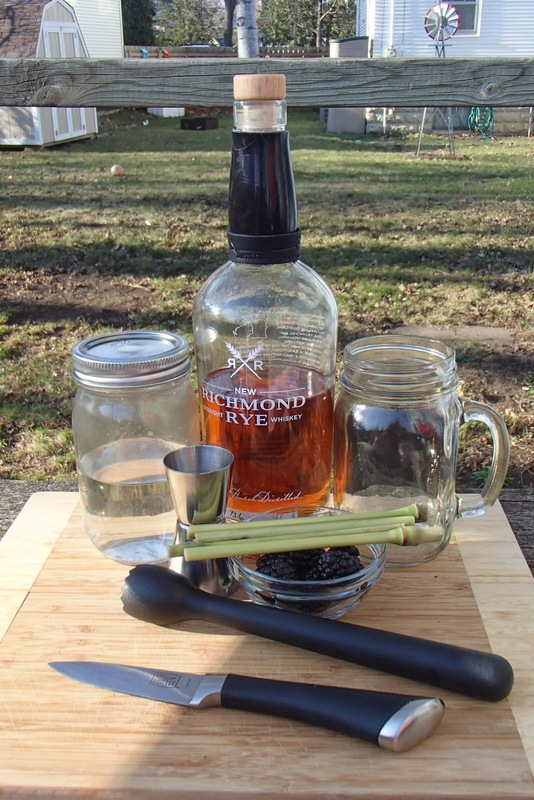 Add the rye, then shake over ice and double strain to make sure you keep those little blackberry seeds of your glass. Garnish with a lemongrass spear and a nice, juicy blackberry. 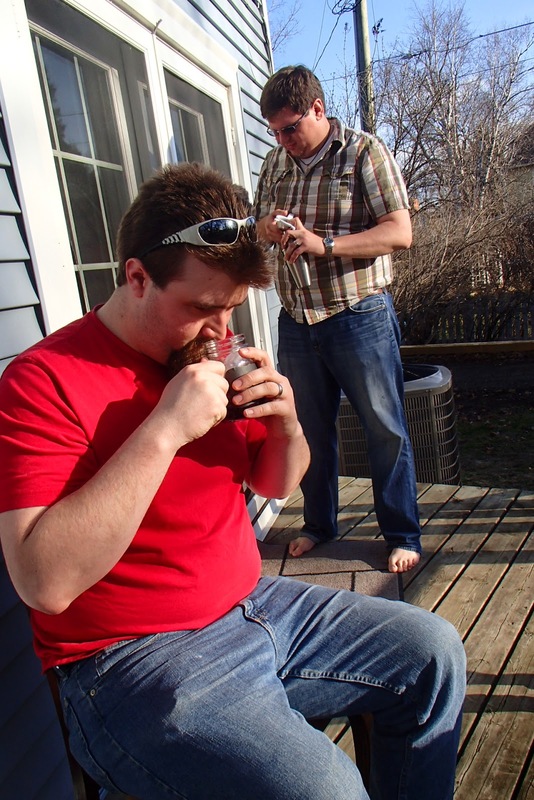 Sam takes a tentative sniff of the concoction I handed him. I was joined this evening by my good friend Sam. He had the blackberry smash as made above, and I had a variant with an added 0.5 part half & half to add a little creaminess to the drink. I’m not convinced that the half & half really accomplished anything substantial, but it did make the drink look more like a smoothie. I’m sure that counts for something. The blackberry smash is very refreshing. You first get the pungent aroma of the rye, but that melts quickly into the sweet and tart of the blackberry. The lemongrass really comes through in the finish, giving the drink a light and fruity aftertaste. Everything comes together very nicely, and no flavor is left out or overpowered. It’s the spice and bite of the rye that keeps this drink from being overly sweet, so I’m not sure how other whiskeys would fare here. 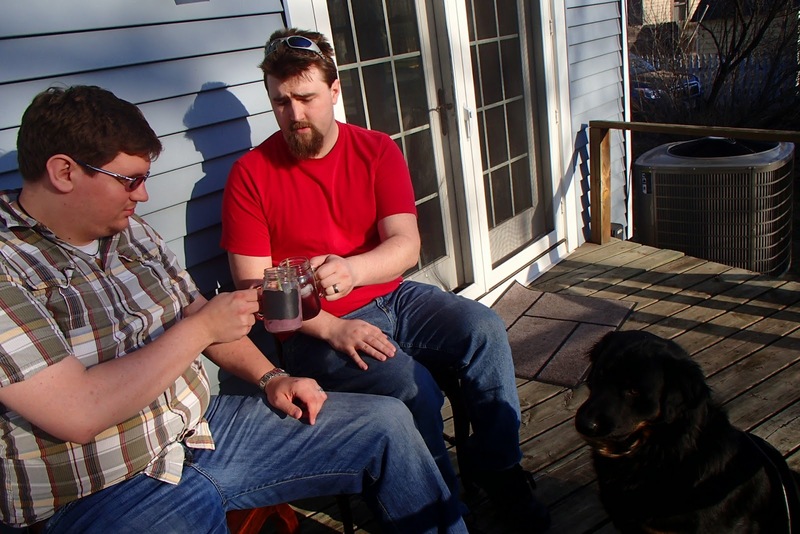 Regardless, I’m content to sit here and sip a blackberry smash with a good friend, my undersized bear, Griffin, and the sunset. Sam and Griffin, sharing a moment. Since I showcased a classic last week, I feel a little experimentation is due this week. 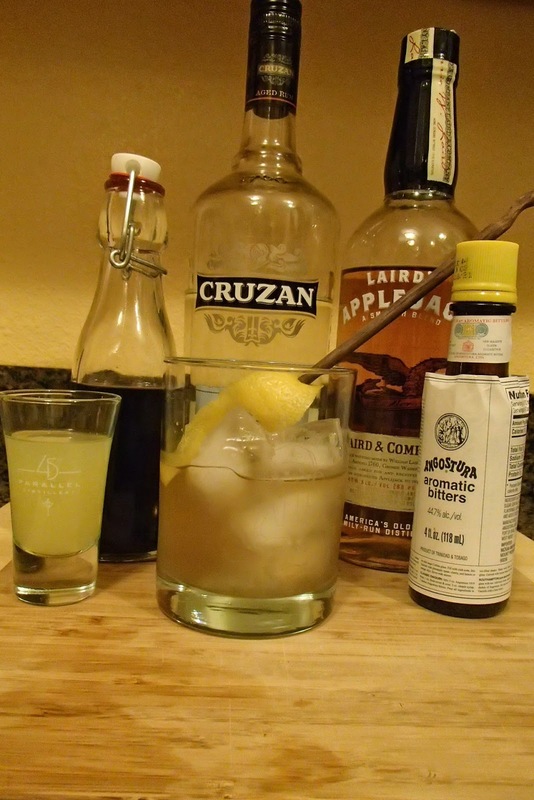 So, without further ado, here’s my creation this week: the St. Croix Buccaneer! First off, the name. The St. Croix is a gorgeous river between Wisconsin and Minnesota, both colloquially and literally, and is located fairly near the 45th Parallel Distillery. 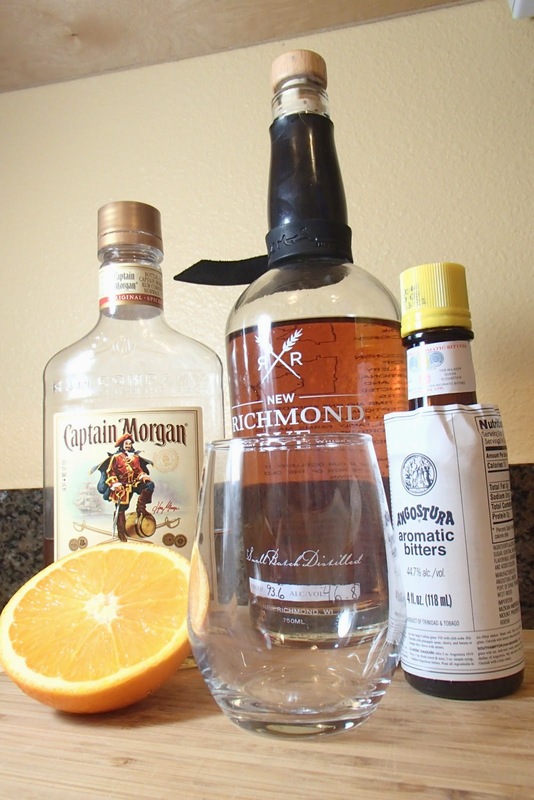 And then, of course, Buccaneer is a reference to the rum and to the citrus. Simple, but effective, and I would love to sip one of these at a canoe-in campsite along the river. The combination of whiskey and rum is nothing new. 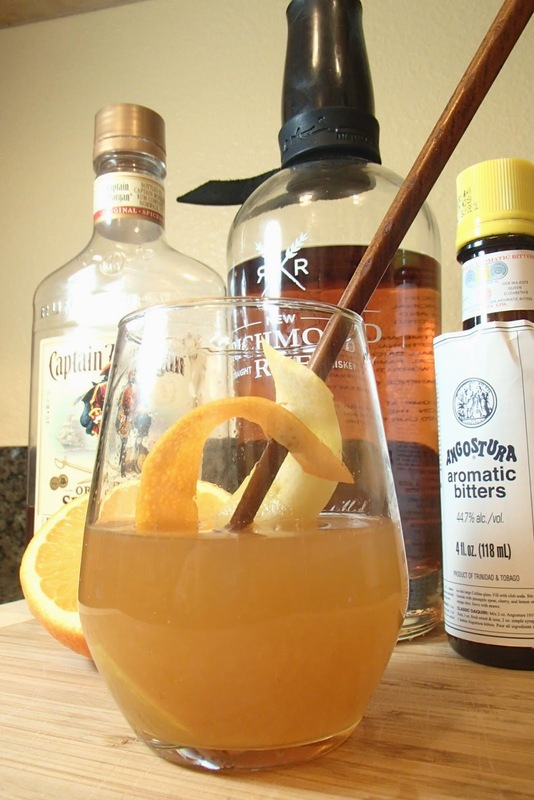 The Suburban (whiskey, rum, port, orange and Angostura bitters) has been around since the late 1800s. 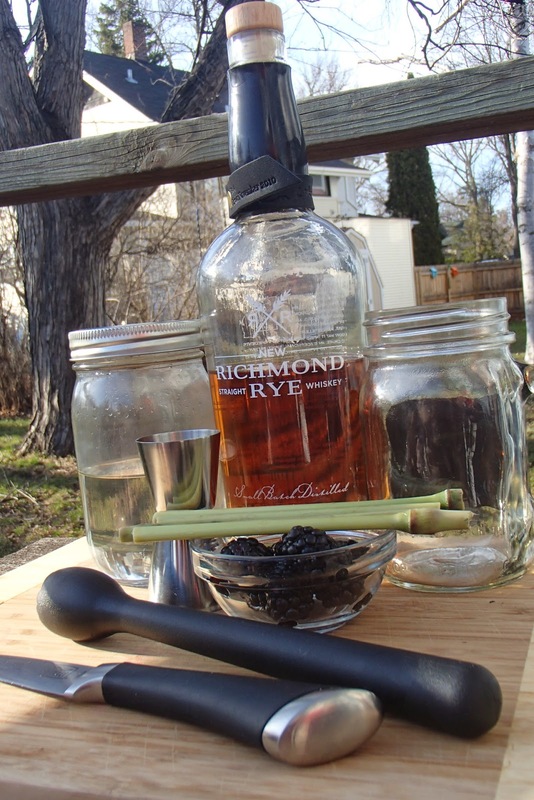 I was particularly intrigued by the combination of spices in the rye and the spiced rum. Instead of sticking with the port, which I felt may overpower the rye, I used simple orange juice for a little sweetness, acidity, and tart. Combine in a shaker with lots of ice. Shake and strain into a glass, then garnish with a long peel of lemon and orange to strengthen the citrus bouquet of the drink. 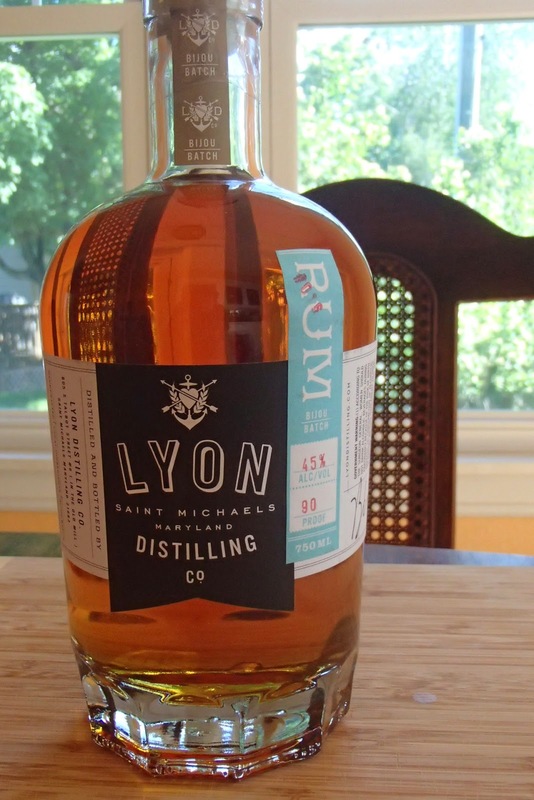 The sweetness of the rum provides a counterpoint to the strong rye. The orange juice adds acidity and a little sweetness of its own. 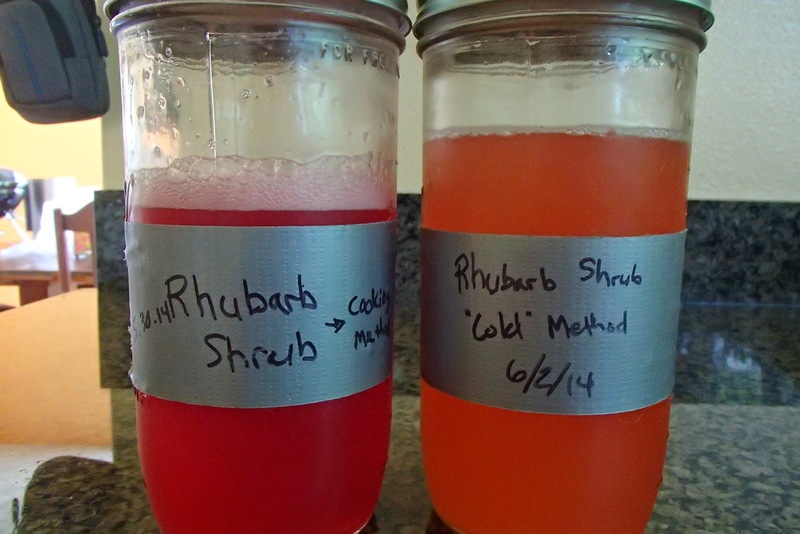 I originally tested with lemon juice, but I felt it overpowered the other flavors. The orange juice is more subtle and lets the other flavors really take center stage. And then the Angostura bitters bind everything together, adding a slight herbal note and enhancing the citrus notes in the rest of the drink. Overall, I really enjoy this drink. The aroma and aftertaste are fantastic, and the woody, spicy, and slightly sweet taste keeps you coming back for more. Thanks for reading, and if you make a St. Croix Buccaneer, let me know what you think of it!